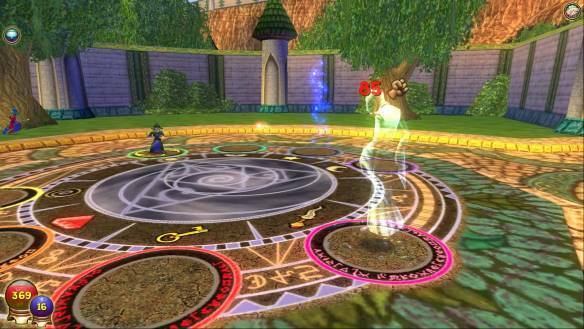 In wizard 101 you take on the role of a new pupil at the magical Ravenwood School of Magical Arts, caught up in a sinister plot conjured by Malistaire Drake, a former professor at the school whose knowledge of death magic has enabled him to release all manner of ghouls, ghosts and strange helephants into the world’s that make up the Spiral. Under the guidance of the school’s headmaster you are sent out with other pupils to end Drake’s abominable plans armed with little more than the handful spells you have learned. In this free to play browser-based fantasy MMO card trading game players can journey through the game’s following the story and being the heroes of their own adventure. Discover the history and lore of the Spiral in this family friendly game as you travel its many worlds, finding new monsters to challenge you and in the process mastering the schools of magic that will make you a great hero. As a fledgling wizard there are a number different schools of magic to choose from: ice, fire, myth, storm, life and death being the primary schools that most wizards will advance in, each with its own strengths and weaknesses. The balance school of magic combines all the magic schools, meaning there is less focus on any one particular school gives a wider knowledge of them as a whole. Astral schools: moon, Sun and star, are only made available to those wizards who have proven themselves to be strong in the magical arts and they are blessed with extra spells to help them in their journey. Players can follow all the storyline quests, engage in PVP combat with the game’s AI or even challenge other players to duel in PVP, choosing from either practice matches or, if you are a premium member, ranked matches. The game is completely free to play and has a large amount of free content to play through; however a subscription waste membership is available which gives access to more worlds, castles and lands, ranked PVP matches, crafting and much, much more. Players can choose from a number of different subscription models: one month, six months and 12 months, as well as a Family Membership option. This one of the key things about this game is its sensitivity to a child audience and parents have full control over who their children can speak to buy limiting the chat options of their child’s account.